Yesterday I came across Lindsey's Call To Action which she affectionately titled May Is For Makers. If this is news to you, go check out her blog by clicking on the graphic below. 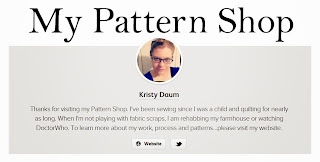 As a Pattern Designer, Maker, and Quilter; I know first-hand what goes into designing, writing and self-publishing a pattern. I have been doing it myself since 2012, and while I have stumbled a lot along the way, there have been a lot of triumphs too. The first of which was being able to hold a pattern I had written in my hands, in all it's prettified, full-color, sealed in a bag Glory. I didn't think it could get better then that; but then I sold one, and it wasn't even to someone I knew. That is a pretty big rush and I remember celebrating that day. Even now, no matter if I sell one pattern via my PayHip shop, or am lucky enough to receive an order from one of the wholesale distributors that I work with, the rush is still there. Like many of the Designers out here in blog-land, I started by offering free tutorials. You can still find those that I have written, up there in my header under what else...Free Tutorials. In the beginning, it was a quick and easy way to get my concepts out there, learn and gain valuable feedback. Yet, somewhere along the way things changed and some people started to expect that everything would be free. Now don't get me wrong, I appreciate freebies like everyone else; but I also have common sense and understand that not everything can, or even should be free. Gosh, can you imagine what a nightmare that would be. I still share free content; but in a much more thoughtful manner and would expect nothing less from the others out there doing the same thing. As Lindsey mentions in her blog post, she started this campaign to not only show some love to the Makers and Designers out there; but to encourage others to do it too. Want to participate; but not sure where to look to find Indie Designers of any sort, a good place to start is Craftsy, Etsy, Bloggers you follow, or even the #MayIsForMakers hashtag on Instagram. In most instances, if I look hard enough at a quilt or quilt block, I can figure out how it is constructed and while you might expect that I would never need to purchase a pattern...I still do. Not only because I'm lazy and just want the math figured out for me...I mean why do it myself when for $9-$12, it's done for me; but more importantly because I know the passion that went into writing the pattern in the first place. We do not write patterns to become wealthy (if you know how to do that, let me know). We do it because we are passionate about our designs, and our artistic vision...and maybe just maybe someone else out there likes what we have done too. To learn how you can be a part of Lindsey's #MayIsForMakers campaign, visit her blog, or check out all of the photos on Instagram of others who are throwing some love to Indie Designers. I purchased my first pattern as part of the #MayIsForMakers campaign...check out what I bought on my Instagram page.